The early trailers for Disney Animation’s Zootopia went out of their way to explain something that most children will understand instinctively: In the world of this movie, animals walk upright, talk, wear clothes, and coexist with species they might otherwise avoid. It felt like a bizarre amount of table-setting to describe how cartoons about animals work, but as it turns out, Zootopia itself is premised on exactly that kind of explanation—and cleverly so. The film’s titular city is the center of a world where evolved animals (mammals only, presumably for simplicity’s sake) have formed a civilized truce. Former predators and prey of all sizes attempt to live in harmony, referring vaguely to the bad old days when being born a certain type of animal meant confining yourself to a certain type of fate. In other words, this is a feature-length cartoon explicitly about the dynamics preventing a bunch of cute animals from devouring one another. “Cute” would be an accurate way to describe the movie’s rabbit hero Judy Hopps (Ginnifer Goodwin, ideally cast), animated with big purple eyes and little twitches of the ears and nose. But early in the movie, Judy protests: “A bunny can call another bunny cute, but when another animal does it…” She trails off, letting the resemblance to certain human distinctions hang in the air. Zootopia is surprisingly and often delightfully specific about its far-from-buried subtext, about the way different groups share certain spaces in this world, trying for harmony but continuing to stumble over judgments, stereotypes, and the legacies of how things used to be. These lingering memories of the past are why Judy’s ambition to become a police officer in Zootopia are met with concern from her family, eye-rolling from larger mammals, and repeated warnings about how there’s “never been a bunny cop.” Stereotypes and old ways of thinking are also responsible for Judy’s bunny parents supplying her with fox-repelling spray when she sets out for the big city. 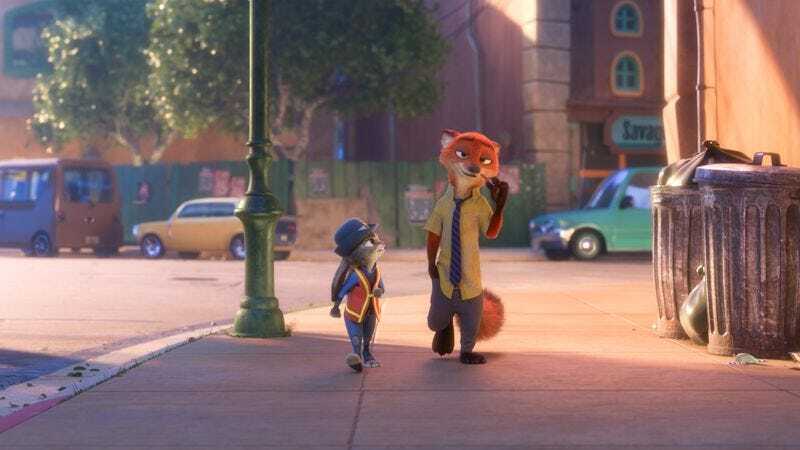 Judy dismisses her parents as ridiculous but finds her own prejudices tested when she’s assigned to traffic duty and encounters a sly big-city fox called Nick Wilde (Jason Bateman). He remains just barely on the legal side of con artistry, dedicated to “hustles,” as he calls them, that don’t technically break any laws. 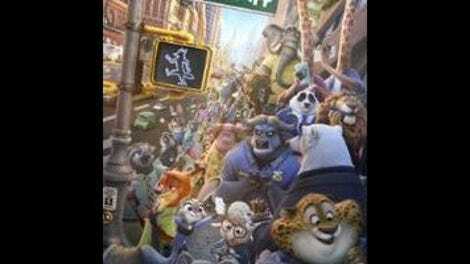 These predictably mismatched animals then team up to solve a series of disappearances within Zootopia, aided by Judy’s determination to prove herself and by Nick’s city-wide connections. As laid out in the film, the city of Zootopia looks something like a supersized Disney theme park, with climate-based districts (“Tundraland,” a rain forest area, and so on) surrounding a bustling central metropolis. It’s all visually rich, especially the downtown area, where a foot chase undergoes a rapid shift in size when Judy pursues a suspect into a smaller-scale rodent neighborhood. As Judy and Nick’s investigation continues, the city’s bright pastel hues shift to more noirish tones, with streaks of streetlamp light. It’s a shame, then, that the twists of the central mystery are simplified, even dumbed-down—and less compelling, in the end, than the movie’s addressing of race relations and urban tensions. The suspect-light urban conspiracy (which never meets the standards of kid-friendly Chinatown knockoffs set by Who Framed Roger Rabbit and Rango) would be easier to overlook if the movie were denser with gags. It’s often funny, with good vocal work from its leads and the requisite mix of energetic character animation and Disney in-jokes (a bundle of freeze-frame gags at a bootleg DVD table; Alan Tudyk playing a character whose name calls back to the Duke he played in Frozen). But for all of the movie’s fast-paced bustle, it doesn’t manage many memorable set pieces. Given that the many credited writers and directors can collectively claim credits on the best recent Disney animation and beyond—Wreck-It Ralph, Frozen, Tangled, Wall-E, The Simpsons, Futurama—the world of Zootopia should buzz with comic energy and memorable supporting characters. Instead, most of the side characters provide only momentary amusement. Like Disney’s Big Hero 6, the movie is busy, but not breathless with invention. Where Zootopia surpasses Big Hero 6, and any number of entertaining second-tier studio cartoons, is the way it ties a typical kid-movie message about believing in yourself—Zootopia is a place where “anyone can be anything”—to the real-world obstacles that can prevent self-confidence from prevailing on its own. By investigating the mechanics of long-held cartoon assumptions (both about the harmoniousness of some cartoon animals, and the characteristics of others), Disney is encouraging viewers young and old to see the world differently and more thoughtfully. It turns out slyness isn’t just a fox thing.